Felicia Suzanne is the sort of nice restaurant where the host takes your coat, new silverware is brought out after every course, and your server scrapes the crumbs off of the table with a tiny, angled silver blade. But as upscale as the restaurant is, it’s never pretentious. The service is friendly, the space is large, but cozy, and the menu is loaded with chef Felicia Suzanne Willett’s take on familiar Southern classics. They’re also the kind of place that stays open, even though a handful of snowflakes are falling downtown. When I stopped by for dinner last week, people were carrying on like there wasn’t a threat of a third snowpocalypse – businessmen in ties circled the bar and several birthday parties drank champagne at round tables. 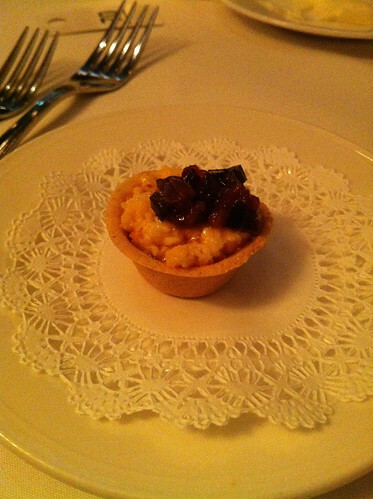 My meal started with a cute little amuse bouche, a pimento cheese tart topped with spicy pepper jelly. For dinner, I ordered a crabmeat salad and a half-order of scallops and risotto. All of the menu items are available in half portions, which are perfect for those with smaller appetites (or those who want to try a little of everything). But then, the food started showing up. Lots of it. Things I didn’t order. Apparently, when I tweeted that I was at the restaurant for dinner, the chef saw it, and responded by sending food. There was a plate of creamy shrimp and grits topped with chopped sausage and a crepe stuffed with chicken, topped with lemon butter sauce. My crab meat salad wasn’t a salad exactly. 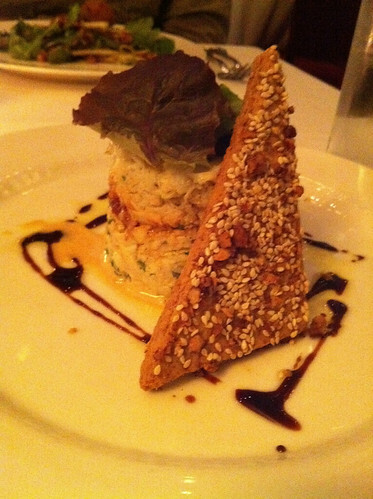 It was more of a tower of sweet lump crab meat built on a foundation of coleslaw and mortared with cocktail sauce. The half-order of scallops was plenty of food. There were two giant seared sea scallops nestled in a bed of risotto with a tangy citrus sauce. When I go back, I think I’ll stick to half orders, especially if I’m getting a side (the side dishes come in large portions). As tasty as dinner was, dessert sort of blew my mind. There was a warm, cone-shaped chocolate cake with homemade peppermint ice cream. There was also a coconut bread pudding with pralines and cinnamon ice cream that may be my new favorite comfort dessert. It’s the sort of good that could cure any emotional ails. I wish I had a picture of it, but once I took a bite, all of my good blogger etiquette evaporated. Felicia Suzanne is a little high end, which makes it perfect for date night, a special occasion or big meeting. If you’d like to try it in a more casual way, the restaurant is open for lunch on Fridays. Once the weather gets warm, ask to sit on the patio. 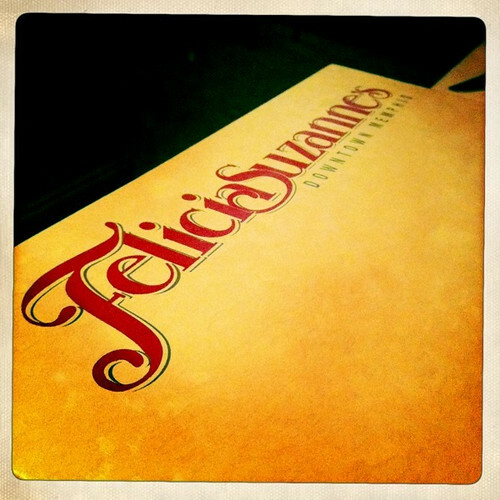 Our ‘gourmet club’ dined at Felicia Suzanne’s last night and we were “wow-ed” both by the presentation of the food and the exemplary service. Having dine around the globe the only comparable service that I’ve had was at Chicago’s Pump Room. After a superb dinner in the main dining room we moved to the large/New Orleans style patio for dessert Thanks for bringing such a wonderful restaurant in Memphis.